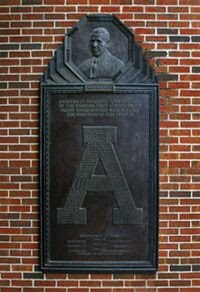 On New Year's Day 1943, Alabama faced off against Boston College in the Ninth Orange Bowl game in Miami, Florida. The video shows the two first-quarter scores by Boston College's Mike Holovak then two of Alabama's scores from the 22-point second quarter surge by the Crimson Tide; a touchdown pass from Russ Mosley to Wheeler Leath and then one by Johnny August to Ted Cook. Alabama won the game 37-21.